Bill Hamilton is one of the most famous and longest serving American UFO researchers. Before he retired, he worked as a Senior Programmer-Analyst at UCLA. He has degrees in psychology, physics and IT. From 1961 till 65, he worked in the United States Air Force Security Service. Had his first UFO experience back in the 50s. 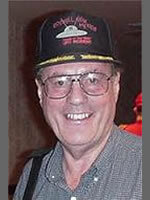 Has been a member of MUFON since 1976. From the Exopolitics Institute: William F. Hamilton III is one of the most experienced UFO researchers in the United States. He actively began pursuing his interests in extraterrestrial related phenomena in 1953. He met and became acquainted with early contactees when attending the Giant Rock Spacecraft Conventions hosted by George Van Tassel. In 1976 he investigated his first abduction case and applied for membership in MUFON as a field investigator. From 1980-83 he served as Maricopa County Section Director for MUFON in Arizona and looked into several CE-3 and CE-4 cases. Since 1980 he has investigated crash/retrievals, military involvement with extraterrestrial phenomena, activity in Antelope Valley California, advanced technology implications, underground facilities, reverse engineering of alien technology and the development of alien biotechnology. From 1992 to 1995 he served as Director of Investigations for MUFON-LA and from 1995 to 1997 served as Assistant State Director for MUFON Arizona. He has conducted Field Investigator classes in Los Angeles. He studied psychology, physics, and engineering in college. He has an AA degree from Pierce College and continues to take science courses at UCLA Extension. He has pursued interests in science, mathematics, aeronautics, computers, and parapsychology. He is currently Executive Director of Skywatch International Incorporated (emeritus). He works as a Senior Programmer-Analyst at UCLA and has worked in the information technology field for over thirty years. Hamilton presented a paper on the electrogravity theory of spacecraft propulsion at the Advanced Propulsion Workshop hosted by NASA scientist Alan Holt at the MUFON Symposium in Houston in 1980. He has maintained an active interest in spacecraft propulsion systems and other areas of advanced technology as well as keeping abreast of the latest discoveries in astronomy and cosmology. In 2002 he presented "In Search of EBEs" at the International MUFON Symposium in Rochester, New York reflecting his growing interest in Astrobiology and new SETV and SETA protocols. This interest led to interviews with microbiologist Dr. Dan Burisch and his work with EBEs and the primal seed of life. He has authored several books, The Phoenix Lights Mystery (2001); Alien Magic: UFO Crashes, Abductions & Underground Bases (1996); Cosmic Top Secret: America's Secret UFO Program - New Evidence (1990); and Project Aquarius (2005) and Time Travel Now (2005). Hamilton has published articles in Search; Energy Unlimited, Borderland Sciences Journal, New Age Science Journal, New Atlantean Journal, Psychic Observer; UFO Magazine, MUFON Journal, UFO Universe and Unsolved UFO Sightings. He has been interviewed on various radio programs including Nippon TV, the Billy Goodman Show in Las Vegas, the Robert Prete show in Los Angeles, Art Bell's Dreamland, and Jeff Rense's Sightings. He has also been interviewed by various network and cable television shows, including ABC News in San Diego and Fox Network's Sightings. Bill Hamilton is a member of the advisory board of the Exopolitics Institute.